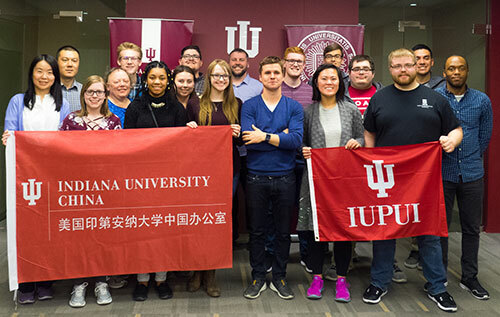 Thirteen IUPUI students from four schools visited Changsha and Beijing, China, through Computer and Information Technology's China: Global IT Citizenship study abroad program. The purpose of the class is to examine the role of the individual information technology employee in a globalized workplace, and to discover the skills and knowledge a professional must have while working with colleagues from a variety of countries. While in Changsha, students visited two Chinese firms -- Sangfor and Sany -- that have developed and depend upon information technology solutions to manage their businesses across the globe. 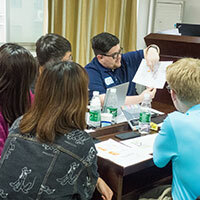 Students also collaborated on a mobile application design project with students from Central South University in Changsha to practice their skills working in diverse teams and learn more about the IT needs and expectations of Chinese users. Once in Beijing, the students traveled to the IU China Gateway office to meet with Nicky Szmala, senior marketing manager at Lenovo, to learn how he navigates everyday life in China as a German national and how his team collaborates across international boundaries and time zones. 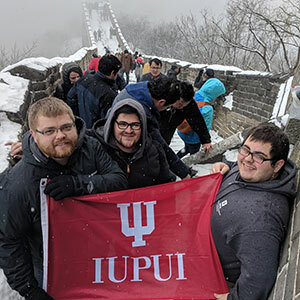 The class explored Chinese history and culture, including trips to the Forbidden City, Summer Palace and Temple of Heaven, and capped off the week with a snowy trek (including a snowball fight, of course) along the Great Wall of China. "If I could give advice to any student who is considering a study abroad program, it would be to do it," said participating student Peyton Niederer. "You will make life-lasting memories, experiences and friends."